Joyce Orr - Director of Pineview Housing Association, SFHA Board member and GWSF member - outlines her experience of the SHR’s Regulatory Framework Review so far in the below article. Joyce has played an active role in both the SHR’s Working Group and SFHA’s Regulatory Sounding Board. 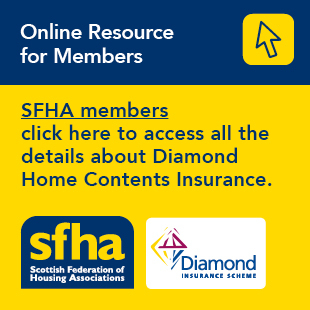 In January 2018 the Scottish Housing Regulator (SHR) issued the discussion paper “Our Regulation of Social Housing”. This is the first wholesale review of the Regulatory Framework which was introduced in 2012. In the discussion paper the SHR gave some initial suggestions on what they thought they might like to change. Responses were sought to the discussion paper by 30 March 2018. Following the discussion paper closing, the SHR examined the 90+ responses received and has undertaken a series of stakeholder involvement events over the past six months. SFHA has been directly involved in two of these. There have been a number of meetings held between the SHR and SFHA’s Regulatory Sounding Board (made up of SFHA staff and RSL member volunteers). In addition, there have been joint meetings between the SHR and SFHA and GWSF members (again made up of staff and volunteer members from SFHA and GWSF). The meetings have been very open and constructive and have allowed both the SHR and SFHA and GWSF members to contribute constructively to the development of the formal consultation proposals. All parties have approached the joint meetings in a truly collaborative way, wanting to genuinely contribute to the proposals for a revised system of regulation that is fit for purpose; proportionate; easily understood and meets the needs of tenants and customers, the SHR and RSLs. Discussions around regulation can easily become defensive and adversarial between a regulator and the regulated. However, the approach for this review has been open and engaging, with no pre-set agenda and all options open for consideration – by all involved. People can be fearful of change and the unknown, and it can take a while to adapt to new systems. However, if the changes are developed collaboratively and for the benefit of everyone involved, then this can only be a positive achievement. The SHR have been very transparent, inclusive and open to ideas with their engagement over the past 6 months. We have discussed the relationship between the SHR and their regulated bodies and the need for everyone to work together and contribute to positive outcomes for the sector as a whole. The SHR has also being meeting with other stakeholders including local authorities and registered tenant groups, to gather a wider set of opinions and ideas. All the information is being considered by the SHR and will contribute to the development of their revised regulatory framework consultation document. The consultation documents will be launched by the SHR in October and will require responses by mid December 2018. Following the consultation, the SHR proposes to publish the revised regulatory framework by the end of February for implementation from April 2019. The SHR has advised that a number of the matters considered at the stakeholder meetings will be included within the consultation. This includes the requirement for annual assurance statements from the governing bodies of each RSL. The annual assurance statement will be each organisation's governing body’s own view of its own compliance with the revised regulatory standards. Organisations will also detail any areas where they believe they do not currently comply with the standards and give details of how they proposed to address this. These statements will be considered by the SHR in its annual risk assessment process for determining engagement with organisations. The annual assurance statements will build on the self-assessment work that landlords currently undertake rather than requiring additional work. The SHR are keen to minimise any additional administrative or regulatory burdens on RSLs and instead see these statements as building on good practice work already undertaken within the sector. In keeping with their aim to make things simpler and easier to understand, and therefore comply with, the SHR is proposing that all the regulatory requirements will be within the one chapter of the revised framework document. This simple change should create one easy, go-to place for governing bodies to refer to when reviewing their compliance. The review of the standards will also over a whole range of other items, including board members skills; succession planning; disposals and organisation change; mandatory internal audit (but not mandatory audit committees); and a requirement to have a business plan. The consultation package to be published by the SHR will be substantial and include the proposed framework document and supporting guidance. Following the implementation of the new framework, the SHR is keen to continue its collaborative work with the sector to jointly develop a toolkit system, which will contain advisory material. Again, the idea is to have an easy-to-access system of information and good practice to assist the sector in its journey to compliance. The SHR will determine its view of each RSL based on all the information it collates about the RSL through annual returns, assurance statements and other communications. SFHA would ask all member organisations to please set time aside to consider the regulatory framework review consultation and submit their responses to the SHR. The consultation period will be from October to mid-December, so please plan this in to your governing body cycle. The more organisations that consider and respond to the consultation, the more likely we are to get a framework that works for everyone. Michael Cameron, CEO of the Scottish Housing Regulator has written a series of blogs relating to the discussions at the Working Group, with the most recent available here: Michael Cameron Blog September 2018.